Recently a newspaper columnist wrote and an Australian politician also said that Muslims become terrorists because of the Islamic teaching of Jihad and other commandments of Islam. A politician serving in the Government here in the UK had also said that there are some commandments or the other in Islam which incline people towards extremism. ISIS has captured regions of Iraq and Syria and have created their own state. They threaten the Western world and have also attacked it in a barbaric way killing innocent people. This has frightened people and has given some leaders, owing to their lack of knowledge or anti-Muslim views, the chance to speak against Islam. It is being written that other religions also had some harsh teachings but their adherents either do not follow those teachings or they have changed them in keeping with the times. They call for the Qur’an to also undergo changes in accordance with the times. This shows/proves that these people admit that the teaching they follow is no more from God but is now man-made. This was destined to happen because there was no Divine promise for these teaching to last till the end. When God stated about the Holy Qur’an ‘Verily, We Ourself have sent down this Exhortation, and most surely We will be its Guardian.’ (15:10) He also arranged for its safeguard. Time and again these people object about the teachings of the Holy Qur’an and try to obliterate it because their own teachings have either been obliterated or only remain in books. Recently a short clip was being circulated on Whatsapp messaging. Two young men where showing people passages from a book which said Qur’an on its cover. They read out the passages to people on the street and everyone agreed that it was such harsh teaching of Islam that led Muslims to extremism. After a while the young men removed the cover of the book to reveal that it was in fact the Bible they were quoting from. No one said anything negative and simply laughed it off, both men and women. Someone said it was surprising because she had been to a Christian school and had read the Bible but had no idea about those passages. Such are their ways; if a Muslim does something wrong it is linked to his religion but if a person of another religious does something wrong he is deemed to be mentally unstable or has learning difficulties. We acknowledge that erroneous actions of some Muslim groups has given Islam a bad name. However, it is malicious and spiteful to target teachings of the Holy Qur’an on the back of it and to get carried away in doing so. One such extreme case of anti-Islam rhetoric these days is coming from a presidential candidate in USA. In any case they can say what they want against Islam, neither can any other religion compete with the beautiful teaching of Islam nor their own revised man-made [religious] laws. These are the answers to the objections raised against Islam. The acknowledgement of people of other religions that they have changed their teachings to suit the times is an admission that their religions are but lifeless. But the words of the Promised Messiah (on whom be peace) are for the Muslim world. They should connect with him and silence the opponents who allege Islam to be a religion of violence. And those who claim to spread Islam through use of force are in fact tools of anti-Muslim powers. The Promised Messiah (on whom be peace) elucidated that this is not the age of Jihad of the sword. Permission for Jihad of the sword was only granted under the specific conditions of early Islam when the enemy wanted to obliterate Islam with the use of the sword. Islam is replete with the teaching of love and peace and today this teachings needs to be propagated. Each Ahmadi needs to understand and practice this teaching and forge a living connection with God. Today it is the Ahmadi who have to impart this knowledge to Muslims and non-Muslims. Those who criticise Islam are ignorant and we must inform them of their ignorance. 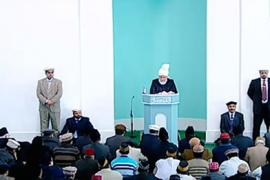 The teaching of Islam is that of peace and security and we have to impart this teaching in light of the Holy Qur’an. We have to ask others how they could say that Islam is a violent religion while having no knowledge of Islam. We have to tell the Muslims that by killing each other and through sectarian strife they are bringing Islam in disrepute. Though our means are limited, still we should carry out this task as much as possible through press, media and other means in every country and every city. It is extremely important to inform the world of the true picture of Islam. With the grace of God our Jama’at focuses on this almost everywhere but the times demand that the media is continuously used for this purpose. Contacts with the media should be maintained and public should be informed [of the facts] via the media. With the grace of God we have good links with the media in USA and also have some links here and in Germany. But these need to be expanded. Recently an MP from Glasgow spoke in the UK Parliament about the reality of Islam with reference to the Ahmadiyya Jama’at. She said Ahmadi Muslims practiced the teachings of Islam. She said she had attended our peace symposium in Glasgow and was full of praise. The Home Secretary who was also in the House responded by saying that the Islam practised by Ahmadi Muslims was indeed different from the one acted upon by the extremists. She added that Ahmadis were peaceful citizens. Of course the fact is that Ahmadis do not represent any new teaching but only present the teachings of the Holy Qur’an. So, if this is not followed up people would soon forget. A remark was made in the UK Parliament but then forgotten. What is needed is to keep it refreshed in minds as to what the teaching of Islam is. After our odd mention in the media, silence follows. A terrorist attack takes places and it garners headlines and opportunity is created for anti-Muslim sentiments to be aired. During his recent tour of Japan many spoke to Hazrat Khalifatul Masih including well-educated people. In fact a Christian priest said that whatever Huzoor said in light of the teachings of Islam needed to be relayed to not just the people of Japan but the world. He said that the message should not be limited to the event in which it was given but should be taken all over Japan through continuous efforts. Now, fair-minded people outside the Jama’at are also telling us not be remain silent but to present this teaching continuously before the world, then alone will it be of benefit. It is now the task of the Jama’at in Japan to plan and keep up the momentum. Similarly, here in the UK and other countries of the world the message of the beautiful teaching of Islam, the insight for which we have garnered from the Promised Messiah (on whom be peace) should be disseminated. Nothing can match this beautiful teaching which is explained entirely in light of the Holy Qur’an. God sent the Promised Messiah (on whom be peace) to present the correct interpretation and commentary of the Holy Qur’an and thus safeguard it. He fulfilled this extremely well through his books, Malfuzat and speeches. God took the task of safeguarding the Holy Qur’an in this age through him and it is also the task of every Ahmadi to take this message to people of every strata of society and of every persuasion. The Promised Messiah (on whom be peace) has thus drawn our attention to present the inherent beauties of Islam by increasing our own knowledge and then attract people through good practice. It is indeed a huge responsibility on every Ahmadi to increase their knowledge of the Qur’an, present good models and attract the world. This is the way we can, in subordination of the Promised Messiah (on whom be peace) serve Islam and the Holy Qur’an and inform the world about it. The Qur’an states about those who do not accept its message: ‘And they say, ‘If we were to follow the guidance with thee, we should be snatched away from our land’…’ (28:58) Here the teaching of Islam is not being criticised on grounds of being violent. Those who do not accept it are being critical that if they abide by teaching of peace and security, people around them will ruin them! Islam teaches peace, if some Muslim groups do not abide by it, is their misfortune. Indeed, they are not safeguarding the commandments of the Holy Qur’an. That is something the Promised Messiah (on whom be peace) and the Jama’at will do. We have to show the world and those against Islam with our word and practice that Islam is not dangerous. As the Promised Messiah (on whom be peace) said it is the falsehood and slander of anti-Islam elements that is putting the world in danger. Big powers also have a hand in the chaotic state of affairs in Muslim countries. Some of them now admit that the Muslim extremists are a product of the situation created by Western governments in Iraq. Those who perpetrate terrorism in the name of Islam are certainly not exempt but the big world powers played a role in stoking the fire. All this has come to pass because justice and fairness was not followed. Times have changed and now a statement given by a big power is not quietly accepted by the world. Through various means of communications every analyst can reach out to the world and express views. On one hand is talk of eliminating terrorists through air strikes and on the other hand those who arm them or carry out illegal financial transactions with them are completely disregarded. World peace is not only being destroyed by the Muslim extremist groups, who are of course creating havoc by going against the teachings of Islam. Rather, big world powers are also involved in this. Self-interest is paramount for them while world peace is incidental and secondary. A true Muslim knows that God is Salam (the Source of Peace) and wishes security for His creation. Among true Muslims certainly Ahmadis have the insight of the commandments and guidance of God regarding giving peace and security to humanity and to establish peace in the world. He states: ‘I swear by his repeated cry ‘O my Lord! That these are a people who will not believe. Therefore, turn aside from them, and say, ‘Peace’; and soon they shall know.’ (43:89-90) This is the teaching of the Holy Qur’an. When the Holy Prophet (peace and blessings of Allah be on him) called people to God, they rejected his message. Not only did they reject his message of peace, they tried to ruin his peace. Yet God commanded to excuse them because they did not have sense and were foolish and asked the Holy Prophet (peace and blessings of Allah be on him) to continue to tell them that his message was of peace and security. Seeing that this is what God instructed the Holy Prophet (peace and blessings of Allah be on him) in the face of persecution of the opponents, how much more important it becomes for every Muslim to follow suit in today’s climate and take the message of Islam to others in this manner. Our task is to disseminate the message of peace and security. As the Promised Messiah (on whom be peace) said if ever force was used in Islam it was in self-defence and to establish peace, never to perpetrate cruelty. It is out of the question that the Holy Qur’an would ever, anywhere command to raise the sword/use force against those who do not accept what we say. If Muslim groups or Muslim leaders are contradicting this with their practice, it is not borne of Islam, it is borne of self-interest or the interests of big world powers who have made these people their tools. On top of this Islam is alleged to have violent teachings! True believers and servants of the Gracious God have been identified in the Quran as: ‘…and when the ignorant address them, they say, ‘Peace’! (25:64) This is what the Qur’an teaches. None of us, in particular the youngsters, should have any kind of complex. It is Islam and only Islam that guarantees peace in the world today and the Holy Qur’an gives the teaching to end extremism. We all need to gain insight of this teaching and to put it in practice and just as the Promised Messiah (on whom be peace) said show the world with our practice that today God has enabled us to safeguard the Qur’an and it is God’s grace. Correct interpretation and commentary of the Holy Qur’an is safeguarding its meanings and God has sent the Promised Messiah (on whom be peace) for this. God has enabled us to accept the Promised Messiah and has thus chosen us to spread this beautiful teaching in the world. It is the responsibility of every Ahmadi. Every Ahmadi boy, girl, man and woman should make efforts towards this. Who love God, The Possessor of Wonders! What is needed is to make our connection with All-Powerful God stronger still and grow our love for Him, may He enable us to try and do this and may He give sense to the worldly people to listen to God and reform themselves so that they are saved from falling in the pit of destruction. Three funeral Prayers were announced. Present funeral Prayer was for Inayat Ullah Ahmadi Sahib who passed away on 9 Dec. He served as missionary for a very long period of time. There were two funeral Prayers in absentia. Maulawi Bashir Ahmad Sahib, dervish of Qadian who passed away on 7 Dec and Syeda Qanita Begum Sahiba of Orissa who passed away on 16 Oct.